In the 1990s, many institutions made a concerted e­ffort to hire more Black faculty members. The universities were propelled by a number of civil rights lawsuits in higher education whose outcomes mandated swift action by states to remedy the effects of segregation in higher education and by White House guidelines reaffirming the need for affirmative action. These schools, including Duke University and the University of Michigan, sought intentionally to recruit faculty of color to their ranks. Dr. Jerlando F. L. Jackson, Vilas Distinguished Professor of Higher Education and director and chief research scientist of Wisconsin’s Equity and Inclusion Laboratory (Wei LAB) at the University of Wisconsin–Madison, says “there still remain significant concerns about our institutions’” commitment to diversity. “It doesn’t take an empirical study … to see that there are some places where you can see some movement and some where there’s none at all,” he says of the hiring trends. Christopher Torres, a faculty member at The Ohio State University at Mansfield and the Latino & Latin American Space for Engagement and Research (LASER), said that, as a Latino faculty member, it was little things such as not seeing any faculty of color on the staff­ portraits in the faculty lounge. “There are pictures of the faculty over the years, but it isn’t until, I think, the ’80s when there’s only one [faculty member of color]. … And it wasn’t until I really started looking at it [that] I started thinking there’s no one really that looks like me,” he says. The lack of representation led Torres to question a number of things, including, “Do I belong here? 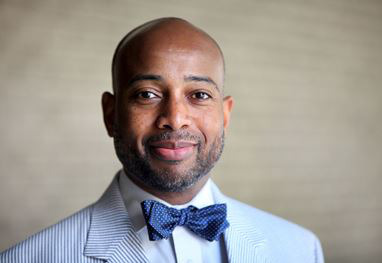 What am I doing here?” Jackson says a concerted effort toward hiring and retaining faculty and administrators from diverse backgrounds must be as intentional an e­ffort as recruiting and retaining diverse students. “If we put our largest emphasis on diversifying a [student] population that is by definition transient, that presents a problem,” he says. The attention to diversity has to come in more than just hiring goals, such as those set by Duke and Michigan. Attention must also be paid to developing the faculty member through opportunities and experiences on campus, say experts. Jackson recommends considering the role of leadership programs on campus and helping faculty members, once hired, to understand fully what is required for promotion. But Torres says that, for many faculty of color, it is difficult to avoid those areas and focus exclusively on research and general academic productivity. “Basically, being a person of color, you’re by default working in diversity and doing service,” he says. Torres continues, saying, “Three percent of the U.S. population has [a] Ph.D. Of those, 5.9 percent are African-American [and] 5.4 percent are Hispanic.” Not only does this mean there is not a strong enough pipeline for faculty of color, but it also means there are not enough mentors in whom students of color can see reflections of themselves and their potential, he notes. Jackson argues that the burden of service can’t come at the expense of academic productivity necessary for promotion, admonishing that service activities, such as chairing a department or serving as an adviser to student organizations, do not count toward promotion. Still, Torres says, many Black and Hispanic faculty members feel more responsible for serving their students. Jackson says that there must be a commitment to diversity by the entire institution. Top administrators need to ask themselves, “How serious are you about the hiring in these institutions?” and then go on to implement policies that reinforce that commitment, he says. Critical for retaining faculty of color is providing opportunities for them to convene with people who share their cultural experiences. This includes mentoring programs and faculty affinity groups as well as opportunities to attend conferences that promote comfortable cultural spaces. A trend toward eliminating diversity departments because the work of diversity is “everybody’s job” is a step in the wrong direction, says Jackson. “Departments often hire amongst themselves with little policing,” he says. This means that no one at the top level is monitoring to make sure that hiring practices reflect the institution’s proclaimed commitment to diversity. Without some directing an intentional effort to correct the lack of diversity in the ranks of academia, the outcomes are often unfavorable, he says.